You can consider this a bonus book in the Uglies series (an extra, if you will&sorry, I couldnt resist). While Tally Youngblood is in it, the story isnt hers. Instead, this is the story of Aya Fuse. Shes a teen living a few years after the mind-rain that Tally and her friends caused. The pretty regime is over and different cities are coping in different ways. While theres no more bubble-headedness, there are equally strange ways of life. In Ayas city, the economy runs on social status, which is dictated by your live-feed. Even though Ayas brother is a veritable star in this new economy, shes stuck as an extra in obscurity way down at the end of the social rankings. Shes determined to break a story so big that it will catapult her to the top of the charts. Aya does, in fact, find a story so big that it could change the world again. In doing so, she endangers her life and is wrapped in a mystery where no one knows exactly what the truth is. And this story is so big that Tally and some of her friends swoop in. A story so big that no one knows how it is going to end. Westerfeld has written another winner and this one is particularly relevant to todays teens. Between MySpace and Facebook and Am I Hot or Not? and a wealth of other websites, todays teens can easily relate to the crazy city that Aya lives in. Westerfeld has challenged notions of beauty and self and now he calls us out on our obsession with fame and popularity. Like the previous books, this is an engrossing page-turner that you wont want to put down. While it will help if youve read the previous books in the series (Uglies, Pretties, Specials), it isnt absolutely necessary. Recommended for readers aged 12 and up. While technically science-fiction / science-fantasy, many teens who arent into either of those genres will still find themselves drawn into the story. I want to start off by saying that I really liked this book, but I felt like it was so radically different than the first three books. It is almost like Westerfield built off the fame of the first book to just include this one in the series, although it could have been the start of another great series. I really felt closure at the end of Book 3, and this book reopened the Tally/David story, without giving me any closure. On that note, once again, Westerfield does a great job at capturing human nature in the purest form. This time, he emphasizes the importance of reputations and social standing. Aya is an average, nobody, just like Tally was in the first book. She is struggling to make something of herself, and by the end, she realizes that being pretty and having a good reputation is meaningless. The great part of the book is that the end sets things up that if Westerfield wants to create another book, he could certainly do so. I am curious to see what the future holds for Miss. Fuse! This book is set in Japan, a few years after the "mind-rain", when Tally Youngblood got rid of the "bubble-heads". Now inew technology, strange surgeries and so on have drastically set apart all the cities of the world. We have a new protagonist in this book, Aya. There are lots of new aspects of this world, of which I'll only explain a couple, because saying them all would take too long. So, everyone has a "feed", which is basically their own space where they can put things they have done/information about themselves on it. Another different thing is that everyone doesn't get their own free stuff anymore. They get merits for doing work, or just being famous. Everyone wants to be famous, and they've all got their own ranking. In the first three books, Scott told us about how people can't be perfect and humanity's inability to be perfect. In this book, he explained to us the human obsession with popularity and how people can make someone a celebrity in an instant... or un-make them. Also there are all sorts of people. There are "surge-monkeys", those who have extreme surgeries, "tech-heads", those who like creating new inventions, "kickers", those who look for stories to reveal to the world to boost their face rank. Aya is a kicker. When I was reading the first three books, I sometimes found Tally quite annoying, but she had grown on me by the end of the third book, so I was kind of sad when we had a new protagonist, and was hoping that Tally would reappear. She did. Okay. The first thing that I want to say about Aya, something that I kept thinking throughout the book. YOU IDIOT AYA, STOP OBSESSING ABOUT YOUR FACE RANK!!! SERIOUSLY! IT's NOT ALL ABOUT THAT! Finished now. No, seriously. Aya was SO obsessed with her face rank throughout the book, basically all she ever thought about was creating a great story to kick to the world. I'm not kidding, if you removed all of Aya's thoughts about kicking a story and boosting a face rank, you would lose two thirds of the book. And I think that Aya didn't really learn her lesson at the end of the book. She should have realised that fame is bogus and totally unprivate, and then become like the Sly Girls at the end, doing dangerous stuff and not caring about her face rank. In fact, at the end, the Sly Girls kind of lost their interest for staying off the charts, which I found annoying, because that's what made them interesting. I found the setting incredibly confusing. In fact, I didn't know that they lived in Japan and spoke Japanese until they met Tally (yes, she reappears in this book, but she has changed a lot. It is strange to be looking at her from the outside) and Scott was like "She spoke in rapid-fire Japanese" or "She switched to English" or "She was unsure of the English word" or something like that. The city name was not even mentioned once. If you have enjoyed the other three Uglies books, this is definitely worth checking out, but it isn't as good as the others, in my opinion. One of the features of the new world is that everyone has a "feed," which is basically their own blog/myspace/tv channel. The ratings of your feed (combined with how much the city interface overhears people talking about you) determines your social status--so everyone knows at all times how famous they are. As Scott Westerfeld explored the themes of extreme beauty in the first three Uglies books, now he takes on the world's obsession with fame and popularity. And how anyone can be an instant celebrity. I think that at the end, Aya should of realized it isn't all about fame and became more like the Sly Girls, not caring about popularity and having fun on dangerous hover board riding. Aya should of NOT be so obsessed with her face rank, and gotten on with her life, one without the fame, she should of learnt what happens with it from her brother. The languages as well were very confusing, and the location of the story to. I had no clue what so ever that Aya and her friends spoke Japanese until halfway through the book, and this to panic from me in the form of flicking back through the pages. And the location of the city was never said, not even the name of city in fact. 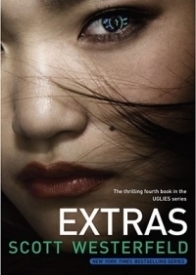 Over all, if you enjoyed the last three books of the Ugly series, than Extras is worth the read, but be warned, it is not as awesome as the others, but still pretty good. This was one of the very best book I have ever read. It was intense and also had Tally Youngblood, Shay, David, and Fausto. That was a nice surprise. Also at the end I could not put the book down. I reall just wanted to know what was going to happen and it was not what i was expecting at all. So all i have to say is read this book and you will never regret reading this book but first you should actually read Uglies, Pretties, and Specials By Scott Westerfled. I finished reading the first three books in the series (Uglies, Pretties, and Specials) and loved them (Especially Pretties, read my review of Pretties) and wanted to read Extras SOOOOOOOOO bad! I got it from the library and started reading it. It was SOOOOOOO boring! I perservered and kept reading because I loved Scott's other books in the series. It took me FOREVER to get through the first, like, five chapters because it just didn't hold my attention and I had to renew the book. I read a little more, again, not holding my attention I loved the whole IDEA but the way it was written was pretty boring! I stopped reading it eventually, not even getting to the part where there's, I guess, ALIENS and Tally and her friends come in. I only know about those because of the reviews on here. I sorta wish I had finished reading just to know how it ends but I am also glad I stopped. I didn't like how it was about this chick named Aya Fuse, I really liked Tally and her story (Even though Tally's story was kinda predictable) I wish, if Scott HAD to write another book in this series, that it would be about Tally. I just don't like Aya she annoys me! Bottom line: I like the rest of the series and the CONCEPT of this book, but Extras was just boring and unable to hold my attention. I mean, COME ON, SCOTT! REALLY?! YOU COULDN'T HAVE WRITTEN IT BETTER?! I don't understand what the people that liked it are thinking. Then again, they actually read the whole book. This book REALLY disappointed me. really enjoyed reading Extras. The book keeps you guessing until the very end - and gives you a lot to think about along the way! scenery and slight change in culture. (though maybe not so far off?) twist. How do we define our existence? phones, texting, IM, and things like red carpet parties and fame. This fourth installment of the Uglies series is listed as a companion novel on Scott Westerfeld's website, but it was way more than that. Told from the point of view of Aya Fuse, 15 year old Uglie, this book follows nicely in the footsteps of the previous three books. It takes place several years after Specials. Aya is a kicker who is trying to up her face rank and falls upon a very interesting story that is definitely worth sharing. The release of her story draws the attention of Tally Youngblood and pulls them all into a journey that only could be written by Westerfeld. Once again, Westerfeld paints this over materialistic world that mirrors things in our world today. He paints a picture of the consumerism we live in, but gives it a hint of fantasy. Readers will be pulled into this book much like the rest of the series, and it is quite a fantastic ride. Great End to a Series ! In the 4th installment of the futuristic Uglies series, Scott Westerfeld brings in new characters from another part of the world. Aya is fifteen, and lots of things have changed since the mind rain a few years back. Now Tally Youngblood is the most famous person in the world. And that's what its all about, popularity. All Aya wants is to be as famous as her brother, but being herself is harder than it sounds. While trying to find a big break, Aya finds out about a secret club of girls who only want to break the rules. So Aya goes undercove, and that's when things start to get wierd. While riding a train, they see "aliens" and now Aya has to figure out which story is better, adn also which one is the most truthful. But soon enough, everyone that she's met is rocketed into a mystery that no one can solve. Alas, here to save the day is Tally Youngblood, and her fellow Specials. While trying to stop the alien attacks, which are believed to want to end the world, Aya and her friends are captured by the aliens, and are told the truth. Now they just have to stop Tally and Shay from burning down half the world! Great adventure, suspense. Awesome ending to a great series ! Aya's story starts out slow. Her brother is famous, everyone watches his feed and Aya's still trying to make her name, find her story. It isn't until she gets in with the Sly girls that things get a little interesting. Sly girls do crazy tricks just for the sake of doing them, not to be famous. About halfway through the novel, I found myself seriously missing Tally, because as far as Aya goes, she's just not my favorite character. I disliked how she taped the Sly girls, and still got to use the footage. How on earth could they have been okay with that? The whole point was that no one would know. The ending gets dramatically messy, Tally shows up briefly, and I can't even like her. She just seems so cold and heartless, it's odd. Extras just made me miss the good old days of Uglies, Pretties, and Specials. It wasn't a bad novel, but it wasn't amazing. It was just there.